Just to the South of the Glacier is an area where the ice has retreated, and not returned, for many season-cycles, and the ground is carved into hollows and holes by the water run-off in the warmer seasons. The Hollow is the largest of these areas, and reaches right down underneath the Glacier itself, where the ice lets light through cracks in the ceiling during daylight. It is a large smooth-stone cave with small catacomb-like tunnels that weave throughout the area, though none of the other tunnels have revealed other exits yet. The main area itself is often quite warm due to the natural spring that bubbles up in the corner, providing warm water for any cat who has become a little frosted over by being caught out in the snow while cool water often drips from the ceiling. The only entrance is sometimes blocked during the cold moons, but is easily dug out, while the smaller tunnels provide separate dens for every cat, and many more. Moss and ivy grow over and into the tunnels due to the natural warmth, but nothing else is of much use to the cats that live here. Eve walked into the camp. "Wow... It feels pretty warm in here." She said, softly. She looked around and saw some hollows. "This would be perfect for our camp." "Water!" Misty exclaimed and went to the pool. She lapped up a mouthful before jerking her head up. "The water is warm! It feels good!" She said, drinking until her thirst was quenched. Breeze followed after the group, coming in after them and looking around. " Cozy." She commented, hoping they wouldn't be hostile. Ok one. Stupid move, coming in here. Two.... they shouldn't be hostile, they where nice to.. Misty? Was her name. Eve looked at Breeze. "Hi! I am Eve! Who are you?" She asked, politely. Ember agreed with Eve with a slight nod of her head. She found a long tunnel that appeared to get smaller as she went inside. It was warm inside the tunnel and she noticed it seemed to end when she bumped into a wall without paying attention. She hissed in annoyance and figured this would be her den. It was long enough to store herbs and had a little area she could make a nest in. "I call this tunnel as my den. This may eventually become a mecidine den if i find plenty of herbs." She said to the others as she poked her head outside the tunnel. Eve smiled. "Of course, Ember! And how about we make the Nest Mothers or nursery over there?" She asked, Nodding to a bigger tunnel. "Then there could be the Members." She nodded to the biggest tunnel. "Then That could be the Sky watchers and over there could be the second in command." She nodded at a medium sized tunnel then a smaller tunnel. "Then that could be Adam and I's Den." She nodded to the smallest. "Oh h-hi Breeze!" Misty said. "I think we might of met before." She said with an embarrassed smile. "I think those would be great. Who would be your second-in-command? Maybe wait till there are more of us?" she asked, shuffling her paws nervously. She always hoped that if she ever joined a group and earned their trust, she could be made like a deputy, or SIC (second-in-command). Eve nodded. "I agree. We should wait till there is more of us. And its Adams Decision, anyway." Breeze looked around. "I'm Breeze.. you seem to be settling in already, better announce what I'm looking for now.." she meowed, flicking her tail around the hollows and tunnels. " I wish to join a group. 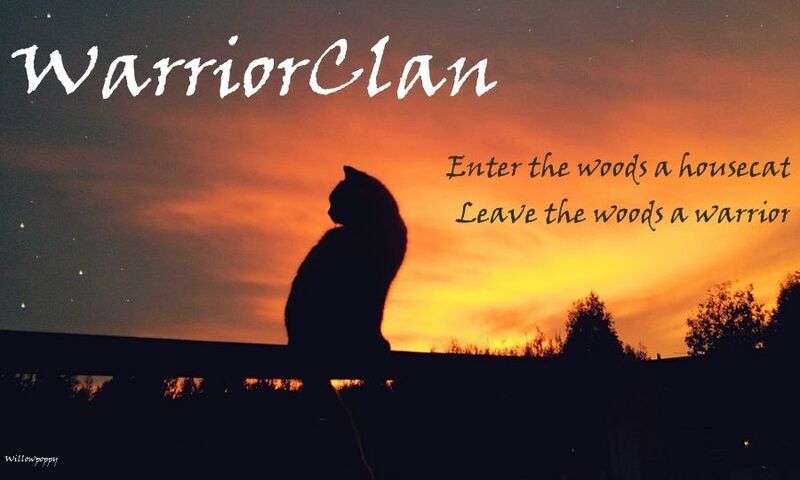 You seem like one that won't.. toucher clans, kill kits, blind other cats, kick out clans, and keep prisoners. Do I make that assumption correctly?" She tilted her head. Eve smiled. "I am hoping for this group to be like that. I don't exactly like fighting and neither does my Husband. We don't really like Onyx's group either. Why should we kick out the clans when we have plenty of food?" " Well.. that's good, Im ok with fighting... as long as it's not senseless battling with nothing to gain.. but, may I ask.. what is a Hubsband?" The word felt odd on Breeze's toungue. "I think a husband is like a mate." Misty said. "I learned that with my old housefolk." She said. Ember listened, then after awhile decided to go inside her den. She was getting tired, after the long journey she recently had. She found the small corner that made a small dent in the ground, perfect for a nest, and she laid down in the spot. She soon fell asleep, her mind wandering off. Eve nodded at Misty. "Yes, husband is what I call my mate. Speaking of Adam, has anyone seen him?" "I haven't since I fainted in the snow." Misty said, shaking her head. "Sorry." Eve frowned. "I wonder where that mouse brain has gone." Adam stumbled in camp, bumping into Eve suddenly, smiling awkwardly. "Oh, hi! Sorry I got lost." He meowed awkwardly. Eve laughed and licked his cheek. "Stupid mouse brain, you had me worried." Adam smiled, feeling guilty. "Heh.. sorry. Anyways, what's going on?" He meowed, looking around at the few cats. "New cave" Misty said and gestured around. "It has a hot spring!" She said happily and moved so Adam could see it. Adam smiled, then saw Breeze. "Who are you?" He meowed, staring at her. "Are you a threat?" He hissed. "Use your brain!" Misty said. "If she's in here, she's not a threat. She obviously hasn't lay a single claw on any of us." She hissed, being defensive. Adam, still being new to this, flattened his ears. "Sorry, uh.." He couldn't get the words out, but rather just sat, his tail curling around him. Breeze looked back at Adam evenly, you her gaze sharp. " Do you think I'd just be standing here doing nothing if I was a threat? Do you think they wouldn't be attacking me right now if I was a threat? Are you thinking your group is mousebrained? That your group can't tell a threat from a friend?" She tilted her head accusingly. "Enough of this. Accusing one another will not solve nor help anything. Now i suggest to go find a cave or tunnel and see if it will be right for you. Or if you have to share, do so. I do not want any arguing or accusations thrown. Adam, you should get some rest now." Ember said to them all, in a quite annoyed and demanding tone. She stood tall as she had spoke her words, looking at each cat in turn as she spoke. "Who made you the leader?" Misty demanded and crouched in a stalking position. She remembered acting like this a lot in Sunset's group. "No one. But i do not want to hear any accusing from anyone. Even though we all just recently joined, if we want to earn each other's trust we must be fair and not hostile at first glance." Ember hissed with annoyance, her tail lashing now. Adam nodded. "Ember is right." He meowed, padding away to the tunnel Eve and him will share. "'I don't want to hear more accusing'. Ha!" Misty said and padded to her den. Has Sunset really turned me into a monster? she thought. Adam let out a low hiss after he heard Misty, but tried to hide it. He lied down, his tail curling around him. Ember simply snorted and went to her den. She laid down at the entrance, hoping this new group would turn into one she would care for for many many moons. His one eye open, he waiting for Eve. I wonder if she's feeling okay.. He began to worry, but knew she would be okay. Eve licked Adams ear as she sat down. "Ill be fine." She said, softly to his ear. Adam has a weird habit of watching her constantly when he was worried about her. She looked around the camp. "I cant believe how far we have come..."
Adam smiled. "Yeah.. I just hope nothing happens.." He meowed, closing his eyes and falling asleep. OOC: When you said that, I thought of Hamilton lol. "I am going hunting, would anyone fit to hunt care to join me?" Ember asked with a more calmer tone of voice. She was not annoyed anymore, just simply restless. "I need to look for any herbs if possible." She added before slowly padding to the entrance of their new camp. Eve looked up. "I don't think now is the time to go hunting, however you may go if you wish." OOC: Actually I'll move around some rogues. New Moon hasn't had much attention so I'll stick her here. New Moon piped up. "I'd like to go?" Ember nodded, suddenly forgetting the cat's name. "What is your name again? I'm sorry for not remembering." She mentioned, bowing her head in apology. Adam opened his eye open, sighing at the fact her couldn't get any sleep. He lifted up, his fur pressing against Eve's. He licked her ear, before whispering to her, "Eve, I'll be back. I'm going hunting, alright?" He suddenly turned, pushing himself threw the moss and ivy, ignoring Eve's response. He padded up to Ember and New Moon, before turning to Ember. "I'd love to go with you guys." He meowed, stretching out. Misty rolled on her back and fluffed out her fur. I'm just a kit, 6 moons old. What am I thinking? I should of gone to the twolegplace. Briar padded into the small hollow with an assorted collection of herbs dangling from her jaws, nose full of the strong scents. New moon swallowed. "I'm New Moon, a old friend of Eve's." She said. Eve blinked open a eye and watched her mate go. She got to her paws and sat outside the den, licking her paw..
Ember nodded and led the way out, hoping she could find some herbs and food. Briar yawned as she padded into the open space, dipping a forepaw into the warm spring to bring some life back into her cold paws and setting the last of her collection of herbs down. "It's becoming a wild storm out there," she warned the other cats. "I wouldn't go out if you can help it." Eve looks up and sighs. "I agree. The snow isn't coming in here but if you go out there it may be bad." She said. Suddenly she felt a strong pain in her stomach. What was going on? Misty raised her head and padded over, fluffing out her fur. “Is something wrong?” She asked.